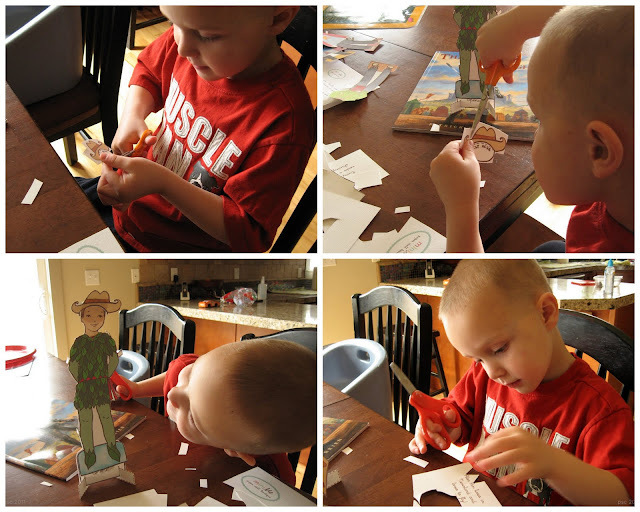 Pickup Some Creativity: Review of MiniMe Paper Dolls...boy edition! 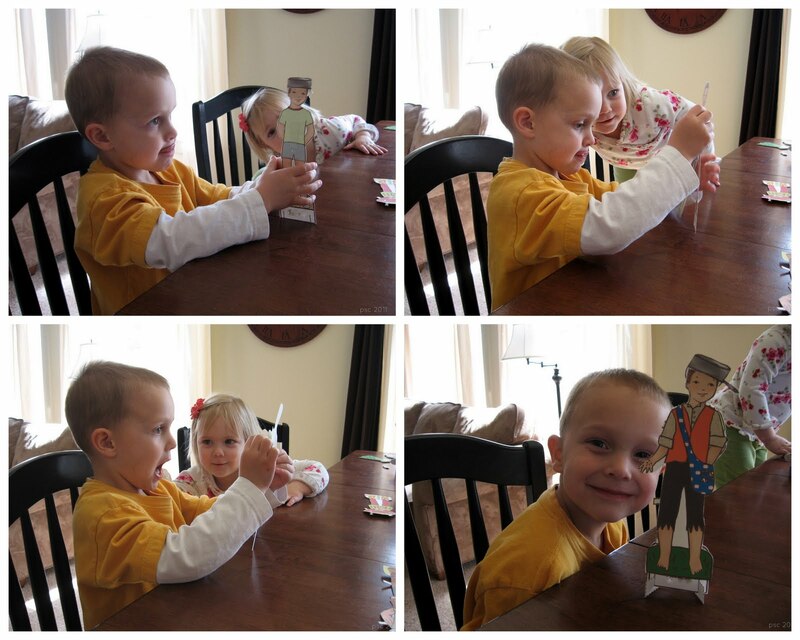 Review of MiniMe Paper Dolls...boy edition! I am really excited to tell you about a wonderful addition to our playthings...including my plaything, this blog. My friend, Hannah, of Lily and Thistle and While They Sleep Designs, has a line of paper dolls she created. The thing I love about them is that they are personalized to match your child, and there are oodles of fun clothing lines that she has developed to go with the dolls. Hannah began with sweet girls...and then added BOYS! When my little guy began his fascination with knights, and I saw that Hannah's fairy tale line included a KNIGHT, I begged her to let us try them out. So, here is my unsolicited, honest opinion of the paper dolls we ordered for my five year old son. On a quiet Sunday afternoon, we opened up the paper doll package, and carefully cut the dolls and the outfits out. Second impression...the fairy tale outfits included Peter Pan, Johnny Appleseed, and especially a KNIGHT! I started singing those funny old Disney songs about Johnny Appleseed and Pecos Bill with my son as we cut out each character's outfit. My son thought it was really neat to dress HIMSELF up, but not have to get undressed. The paper, on which the doll and outfits are printed, is heavy with a bit of texture to it. I think they will last a while...and if they ever do get a little worn out, we can always print off more using the pdf files we were sent. Third impression...I loved the pages that are included that help record my son's own story, including details about his life, his family tree, and interests he has at this time. It's a wonderful snapshot of him at age five. One small issue we've had is my son gets frustrated by the tabs on the clothing. Using the sticky strip included in the package has helped a great deal with that! I have been so pleased with our paper dolls. They are ideal for a quiet afternoon. The fairy tale outfits lend themselves perfectly for telling stories. Another bonus, we don't have to get out the big dress up mess! Thank you, Hannah, for letting us try your dolls and for sponsoring my blog. I can't wait to get a set for Baby when she is old enough! Those look so great! I bet my boys would love that when they are a little older. Those are so darling. Love them. I love the different looks of concentration on his face! What a great toy (and brings back great memories for me too). These are adorable. Your son looks like he really enjoys them, too.